We recently moved all our furniture around in our house. It was essentially a room swap where the living room, along with the television, moved to the dining room. Of course I did this without considering the lack of an outlet for the TV antenna. We have a Mohu Sky 60 on our roof, which by the way, is an awesome outdoor antenna. To make matters worse, the premiere of Downton Abbey was about to start and my wife was without live PBS access. That’s when I remembered the Mohu Curve we used to have before I installed the outdoor antenna. I set it up and it worked like a charm. Since, this sleek Antenna still holds up as a great antenna I’ve tried, I wanted to re-post my review from last year. Below is my initial review of the Mohu Curve. When I originally talked to my wife about cutting the cord, one of the first battles was over a TV antenna. Whether the antenna was indoor or outdoor, she had one major requirement. The antenna had to look nice. Not only does the Mohu Curve meet that requirement, but it’s as functional as it is attractive. When taking the Mohu Curve TV Antenna out of the box, I was immediately taken by the Curve’s sleek modern appearance. 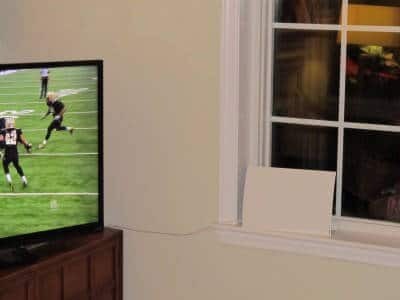 Mohu recently turned me around on indoor antennas when they sent me the best indoor antenna you can buy, but I was skeptical of a TV antenna that was this easy on the eyes. Setting up the Mohu Curve is extremely easy. The stand just snaps onto the back of the antenna. The amplifier is even labeled to let you know which end is to be plugged into the TV. The amplifier is powered by USB. Therefore, it can use an available USB port (many modern TVs have them) or the included USB power adapter. Everything snaps or screws in with ease. 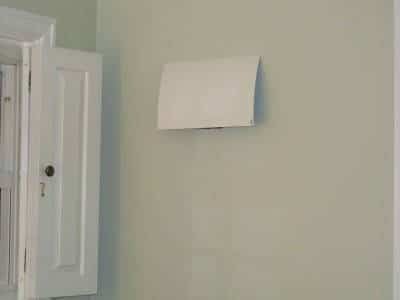 Once assembled the Mohu Curve is only 2.5 inches deep, which simplifies finding a home for it in your house. Typically, my first instinct is to hide or camouflage a TV antenna. However, I liked the look of the Mohu Curve and wanted to showcase it. 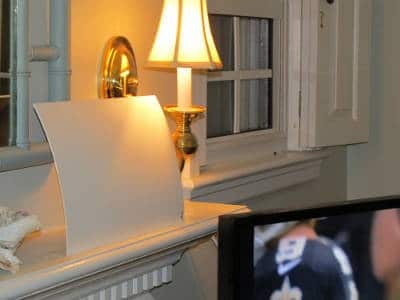 As you can see by the headline photo, it looks great on a mantel. The stand is made so it easily attaches to a wall. For those that absolutely despise exposed cords and cables, the Mohu Curve is an excellent choice as it’s designed to allow an easy wall mount. Since the Mohu Curve can attach to the stand after mounting the stand to a wall, it’s possible to run the coaxial cable through the wall to your TV set. Then you just screw the cable hanging out of the wall into the back of the Mohu Curve, and simply snap the curve into the stand. This would hide the coaxial cable, giving it the look pictured below. The Mohu Curve TV antenna looks great just about anywhere. I tried placing it on bookshelves, the mantel, and the wall. It just seems to blend in and look like it belongs. I dropped on the window sill in the picture below, and that didn’t even offend my eyes. 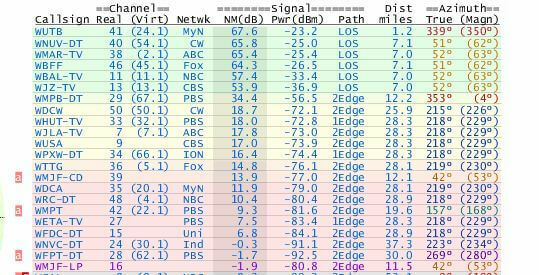 For optimal performance I recommend using this signal tool on TVFool.com. Just type in your address and it will create the table below letting you know where the TV towers are in respect to your location. I’ve also put together an episode of the Grounded Reason Podcasts that walks you through using TV fool. The field marked NM(dB) stands for “noise margin.” This field indicates how much “noise” the signal can withstand and still be received. Typically, a noise margin above 40 dB can be picked up from an indoor TV antenna. The “noise” comes from passing through walls and trees in and around the house. The line from the TV to the antenna generates about 10 dB of noise on average. Adding a longer coaxial line or splitters will increase the noise. However the amplifier’s job is to mitigate that noise in the line. 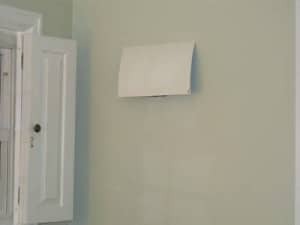 The amplifier itself generates noise, but will cancel out the typical noise encountered with an indoor antenna setup. Update: Since the time of originally writing this review, we have installed the Mohu Sky 60. Currently I have an inexpensive roof mounted antenna that allows me to receive 37 channels in crystal clear high definition. To test the Mohu Curve I disconnected the roof antenna and hooked up the Mohu Curve. 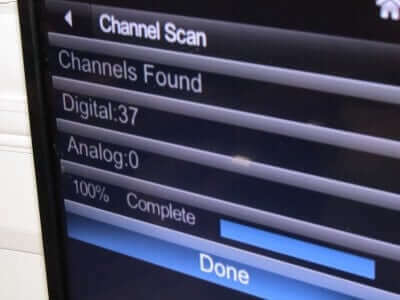 Once installed, I ran a channel scan on my television. The results are pictured below. That’s right! I was able to receive all 37 channels my roof mounted antenna receives. Each one was crisp and clear. I ran the scan from a few locations around my television and it picked up the same channels each time. Mohu has a truly fantastic TV antenna in the Mohu Curve. I highly recommend it if your signal report shows you can use an indoor antenna. Why climb out on the roof if you can get the same results from this attractive indoor TV antenna. 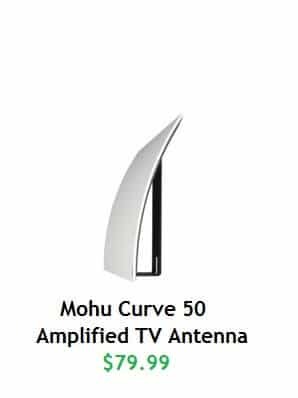 If interested in purchasing the Mohu Curve TV antenna, you can support this site by using the link below. Mohu compensates this site a few cents on the dollar for purchases made through the link. I only provide links to purchase products I’m comfortable recommending and use personally. Mohu is running a sale. Enter promotional code “super25” at checkout for 25% off.